Author John David Anderson is here today at Adventures of Cecelia Bedelia with a guest post on the top ten lamest superpowers. 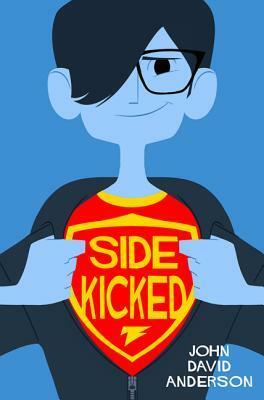 His middle grade superhero book Sidekicked was released in hardcover by Walden Pond Press on June 25, 2013. Check out the end of the post to win a *signed* copy! Drew Bean, the earnest and often out-of-his-league protagonist of Sidekicked is both burdened and blessed by his extraordinary senses. While an excellent supplementary power, this is pretty much Drew's only power, and he spends no small amount of time lamenting on the lameness of being able to smell, see, and hear evil coming and being incapable of stopping it. In honor of Drew, I've made a list of superpowers which, in certain contexts, could be even lamer than his. Disclaimer: These aren't the ten worst super powers or necessarily even powers held by actual heroes. Naturally there are powers that are entirely undesirable (the ability to turn oneself into a diaper) or ludicrous (the power to vanish into thin air...once), so the following is simply a list of powers, imagined or real (which is to say, imagined by someone else), that wouldn't necessarily make a superman super and might leave you in worse shape than if you'd had them to begin with. 10. External combustion (i.e., flaming on): A staple of superpowers, the ability to surround oneself in an aura of flame makes for outstanding cover art and dramatic action sequences replete with smoke-filled skies. One must consider the drawbacks, however, namely the flammability of objects around you (just imagine battling in a paper mill...or a gas station) and the need for specially tailored fire-retardant underwear, which can't be cheap. 9. Talking to animals: First we should make a distinction. The ability to simply talk to animals does not grant you dominion over them. I can talk to my children, but I am often powerless to get them to obey even the most simple of commands (i.e. please stop sucking Jell-O through your straw). Therefore, while the ability to control animals would be awesome, simply being able to talk to them would probably be boring as conversations would run from "Can I eat you?" to "Please don't step on me!" to "Where did I put my nuts?" 8. X-ray vision: Granted superspies the world over would relish in such a gift, and it might bring down the astronomical costs of an ER visit for your kid's baseball injury, but there is a reason we have fences, walls, clothes, and skin. There are lots of things you just don't want to see. Like what's going on inside my stomach right now, and what most people really look like in the morning. 7. Rock form: While there are certainly stalwart heroes that are either primarily made of some rocklike substance or are capable of creating an exoskeleton of them, the ability to transform oneself completely into a rock leaves a little to be desired. While useful when battling hordes at the top of a hill, the lack of appendages, not to mention the lack of eyes, ears, mouth, nose, muscle, bone, weapons, and unassisted movement means you are probably just going to get stuck at the bottom of that hill after rolling down it. 6. Atomic farts: Literally the ability to create near nuclear explosions by means of one's flatulence. Naturally the hero with this power would concurrently be blessed with an invulnerable digestive tract as an added bonus. However the costs associated with the power, both in terms of ancillary property damage and potential loss of life (can you control your flatulence's reach and direction? ), plus the heroes constant need for extra tights, far outweighs this power's utility. Plus it makes for awkward dates. 5. Self-replication: Imagine if there were only two of you. Or twelve. Fantastic. Except I personally have a hard enough time keeping track of me. Ever seen the movie Multiplicity with Michael Keaton? Me neither. But I'm guessing having multiple copies of yourself out there only leads to trouble or they wouldn't have made a movie out of it. 4. Magnetism: This is different from the ability to manipulate magnetic fields (ala Magneto). This is simply the ability to turn oneself into a giant magnet. Awesome when you can't quite reach your spoon at the dinner table, less so when the steak knife comes flying at you too. Really awkward when the family minivan comes crashing through the garage wall towards you giving a wide opening for all your power tools to head your way as well. Definitely a power you will want to learn to control quickly. 3. Sonic scream: Yes, I know it has its uses, but as a father I've come to realize the true agonizing power that high-pitched wailing can have on a person, and it is not something I would inflict on my worst enemy. 2. Liquefication: Yes, the ability to liquefy oneself is incredibly useful when a supervillain is about to blast you with an anti-matter ray and you happen to be standing over a sewer drain; however, turning oneself into a puddle has numerous drawbacks, including the "ewww!" factor, the potential for bystander accidents (slippery when wet), and the fact that janitors everywhere are suddenly your mortal enemies. "Mop-Hands Hannigan! I should have known it was you!" 1. Anatomical Liberation: I'm not making this up (see Arm-Fall-Off Boy, an honest-to-goodness hero in the D.C. pantheon): This is the ability to sever a part of your own body and use it independently of the rest of you (like having just your hand scuttle through a tiny opening to retrieve a secret document). However, this power does not automatically come with regeneration, so you have to find said limb in order to get it back, and it's possible that said body part may decide to split permanently, taking on a life of its own. Not to mention there are actually few body parts I would trust to just go off and fight crime without me. Thanks for sharing your top ten list, John! If you'd like to share your own lame superpower ideas or just want to find out more about Sidekicked, you can visit the author at www.johndavidanderson.org or on Facebook at JohnDavidAndersonAuthor. You're interested in checking out the rest of the Sidekicked Superhero blog tour stops (they have giveaways! ), right? Good! Oh, and that giveaway I mentioned! The kind folks at Walden Pond Press are providing one signed copy of Sidekicked for a lucky blog reader. To enter, simply fill out the FORM. Giveaway open to US addresses only, will end on July 27 at 11:59pm EST. Winner will be selected randomly and notified via email. And I'll just tell you now, you can earn an extra entry by commenting on this post with a lame superpower. Pick one of Mr. Anderson's or make up one of your own! Fine print: Blog tour and giveaway organized by Walden Pond Press. I did not receive any compensation for this post. This blog post moved my interest in reading the book from "slim -to-none" to "CAN'T WAIT TO GET MYHANDS ON IT!" Well done. Funny stuff. Love everything about this post! I never really thought about what superpowers were considered lame, but if I had to choose I would definitely say that time travel you can't control might top the list. Sure, you can travel in time...but you have no idea where you'll end up or it you'll make it back. Let's just talk about Black Bolt, shall we? Every time he speaks, he moves mountains. What if he's all "hey, let's get some pizza!"? Earthquake. Aquaman had a strange power to be so popular. How many supervillians plot their crimes in the ocean? Robbing a bank, have no fear, Aquaman will stop you with a team of dolphins and a sea cucumber. DOH! Guess not. Sonic scream is pretty lame. Thanks for the giveaway! My lame superpower would be the ability to levitate. It would be cool, but what good is it if you can't actually fly? Lame superpower - X-ray vision. What is your parents were hiding a cool new bike, and you ruined the surprise by looking through the walls and finding it?? Lame superpower- X ray vision. Surprises wouldn't be surprising anymore. You would be able to see through walls, and run all future surprises.